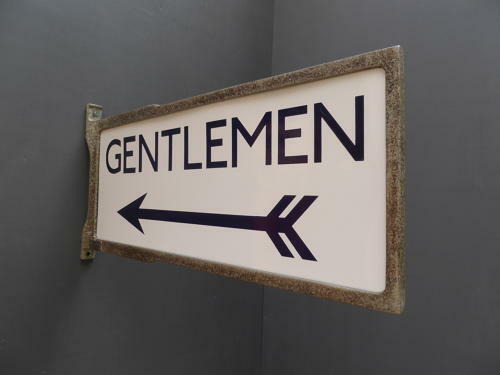 A rare early vintage 'Gentlemen' enamel railway sign. Double sided & featuring the iconic directional arrow & housed in its original cast aluminium wall bracket which boasts a fantastic patina. Formerly used by London Transport on the London Underground tube network so a wonderful piece of history. A very seldom seen enamel sign which displays beautifully. Minimum wear commensurate with age, sign in excellent order with a good gloss. One old naive but secure repair to the lower part of the bracket which is actually rather pleasing!